David Weil is the Dean and Professor of the Heller School for Social Policy and Management. In a fascinating career as an applied researcher, author and policy maker, he rigorously analyzes real world problems, then works out practical policy options to fix those problems. Prior to joining Brandeis in August 2017, David was the Wexler Professor of Management at Boston University’s Questrom School of Business. In 2014, Barack Obama appointed him to head the U.S. Department of Labor’s Wage and Hour Division, and charged with “making sure working people got a fair day’s wage for a hard day’s work.” He describes it as the best and hardest job he ever had. 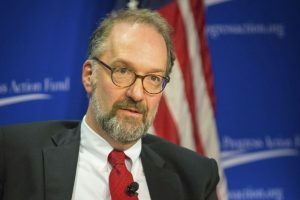 In his 33-month tenure, David Weil fundamentally shifted that agency toward a more proactive, data-driven approach to enforcing and updating labor protections that affect more than 135 million U.S. workers in 7.3 million workplaces. This shift included the extension of overtime protections to more than 4.2 million workers previously not covered by overtime. David Weil is an internationally recognized expert in employment and labor market policy; regulation; transparency policy and digital empowerment; and the impacts of supply-chain and industry restructuring on employment, work outcomes and business performance. He’s authored more than 100 articles and five books, including, most recently, “The Fissured Workplace: Why Work Became So Bad for So Many and What Can Be Done to Improve It,” examining how outsourcing changes business organizations and erodes relationships between employers and their workers. He co-founded and co-directed the Transparency Policy Project at the Harvard Kennedy School of Government, and advising state, federal and international agencies and organizations. He also advises regulatory agencies, international organizations and several countries on workplace issues. He also has worked as a mediator and strategic advisor to labor/management groups and labor unions in the US and other countries. David graduated from Cornell University’s School of Industrial and Labor Relations, earned a master’s in public policy at the Kennedy School and a PhD in public policy at Harvard. David and his wife, Miriam, a geologist, live in Belmont and have two daughters Rachel and Alanna.